Looking up the road toward the hill. Pak Beng only exsists because of tourists.It lies on the Mekong River and serves as a mid stop over point for people traveling south to Luang Prabang. The town consisted of one road leading up from the river with restaurants and guesthouses clustered either side. It only has power from 6pm to 10pm, so it was pointless getting a room with air conditioning. We settled for a very basic place at at cost of $3. It had wafer thin walls and no windows. We had an Indian meal and retired for the night. We were awoken abruptly during the night with shouts coming from the main road. 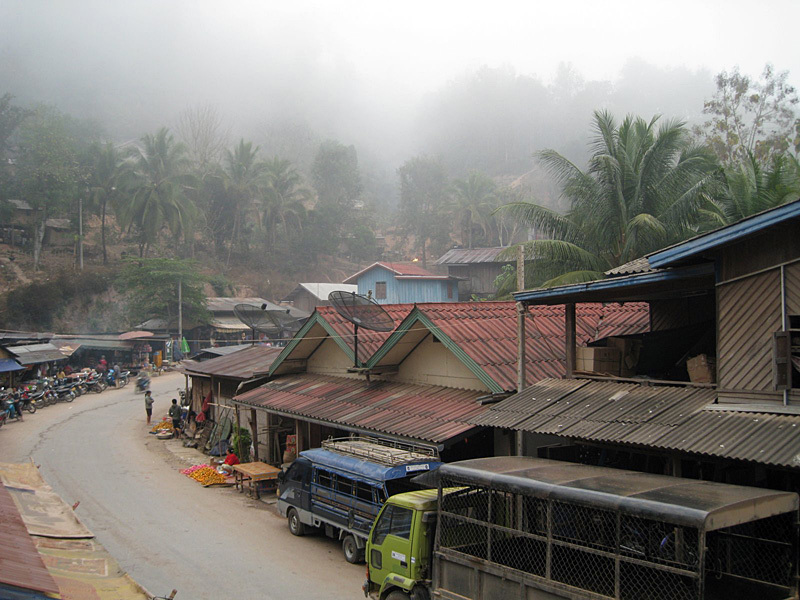 The next day we were told that some mad Laotian (the village idiot) had decided to break into a few guesthouses. But with people inside he was scared off. At 8am we walked down to the waters edge and managed to get the last remaining seats on a very full slow boat to Luang Prabang. My word the boat was slow. It stopped every 2 hours to pick up yet more Laotians. I was a little envious of the speed boats blasting buy every few hours and we inched along for hours. Our boat was so crowded that the stern of boat was taking in water with tourists crammed in there. It was lucky that we didn’t sink. After all day of watching the grassy banks go by we arrived in at our destination. It was a relief to see something that looked like civilisation. We grabbed out bags and walked up from the docs to our new guesthouse; our home for the next 3 days.